Cut the corn kernels from the cobb; add tomatos & onion. In a blender, combine all dressing ingredients. Blend until smooth. 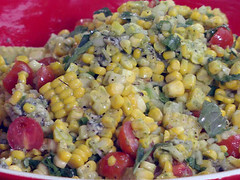 Toss corn mixture with dressing. Top with blue cheese. * One medium ear of corn yields 1/2 cup corn.